I now understand the popularity of DIY here. Not like in the Philippines; DIY there is usually confined to arts and crafts. Here it's anything that requires manual labor -- haircuts, hair dye, manicures, electrical wiring, assembling all the furniture in your house (hello Ikea). Because anything that needs a human is expensive. My small leap into DIY is painting my own nails. Don't laugh! I miss seeing my hands clean and manicured. And you know those ads that come up when you're browsing sites like 9gag... io9... ahaha my surfing haunts are becoming painfully apparent. Anyway, I clicked on one for a free beauty box from a nail lacquer company. 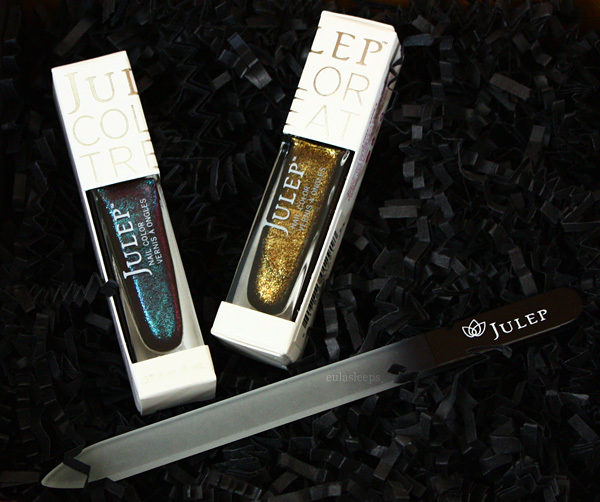 Julep is an independent polish brand with a 4-free formula in lots of gorgeous colors. 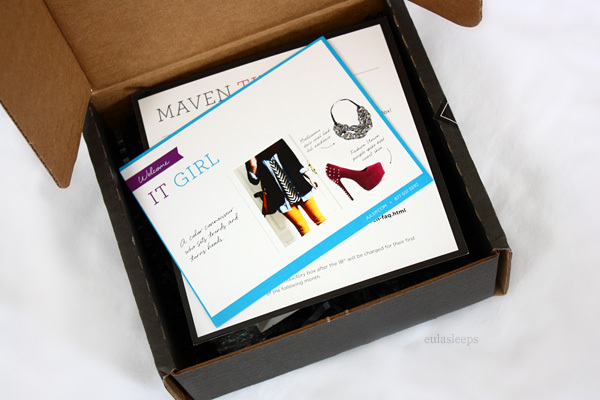 Yesterday I mentioned availing of the free Julep Maven box. (Click the link to read about how to do the same and the options available to you.) I was assigned the Boho Glam starter box but the colors didn't appeal to me, so I chose It Girl which comes with 3 bottles of polish. I later found out that each box also includes an extra gift. It arrived in a sleek black cardboard box, with everything nestled in equally black shredding. 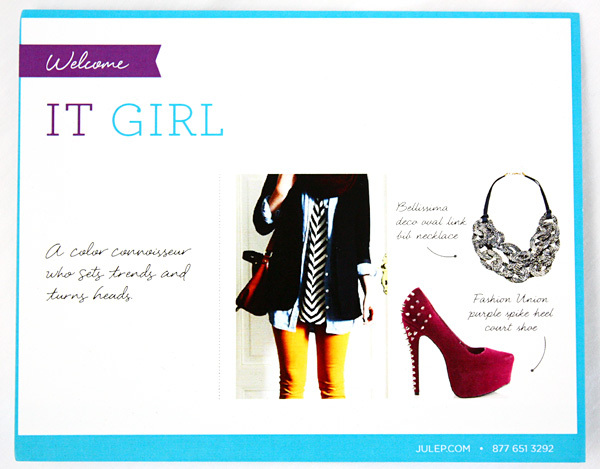 The two cards explain the Julep Maven box philosophy. Underneath were the three polish bottles housed in individual white boxes. (The third box is gone because I gave it to my cousin.) I love contrast so this design really appeals to me. I really like the clean design of the polish boxes, silver text on white. The formulas are "4-free" -- manufactured without without dibutyl phthalate (DBP), toluene, formaldehyde, and formaldehyde resin. As a carbivore and lover of cookies I enjoy eating with my hands, so I appreciate "safe" formulas like this. The bottle is sleek and the corners give you more grip. Perfect when you're trying to open/close the bottle without wrecking your drying nails! The bottles even have a sticker on top to swatch the polish. Super time saver for those with a ton of colors. I'm going to do it for all my bottles. Josephine is a deep teal grey crème. 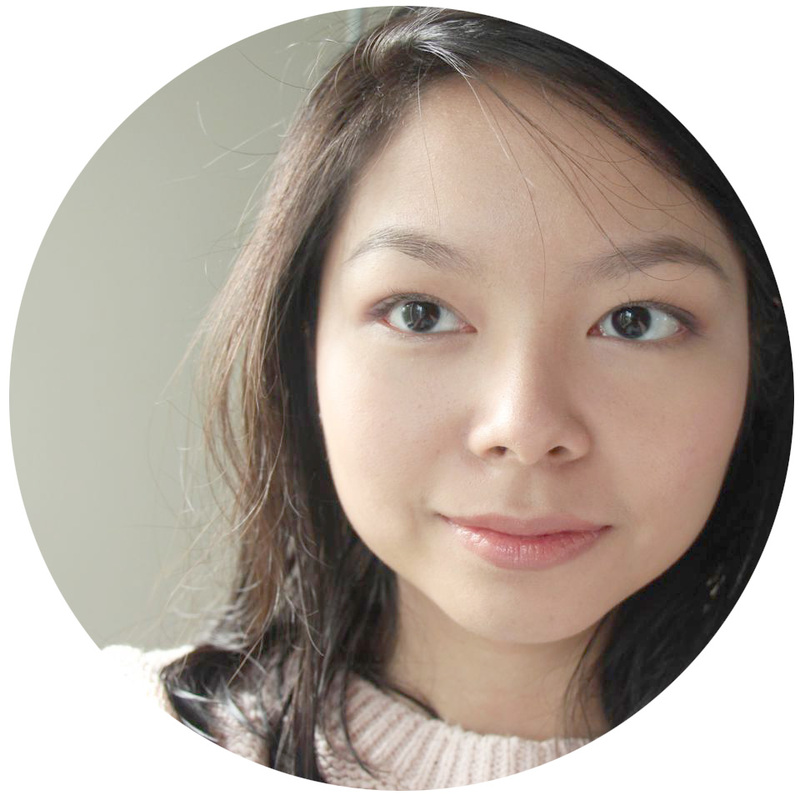 I gave this one to my cousin, but here's a swatch from the Julep website. Don't you love that they swatch it on both dark- and fair-skinned hands? Gives you a better sense of how the colors will play with your skin tone. Ciara is a purple-magenta with teal microglitter. I've always been partial to creme finishes, never liking chunks of glitter in my polish. But I am seriously taking to microglitter. It adds depth to an already unique color, making it almost a duochrome. This is two coats above. Pretty shiny, even with no top coat. It brightens the complexion somewhat. Candace is the color I was most excited about, a deep chocolate with gold microglitter. 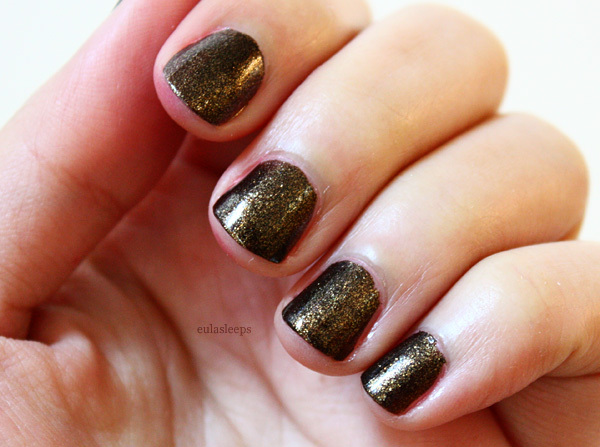 At first glance it reminds me of the OPI Liquid Sand line, but this has a smooth gloss texture. Conservative enough for work, but has an interesting sparkle, very complex. Have I told you how much I like gold? Yellow golds are perfect for summer. Now that it's fall I find myself gravitating toward deeper ones like this. Wonderfully opaque with just one coat, as swatched above. No top coat on this either. The consistency is on the goopier side, which I think what helps it apply so opaque. Drying time is longer than usual for the same reason. Amazingly, even while playing it rough with dishwashing and fruit-peeling and rummaging around for keys, it took 4 full days before some very minor chipping started to occur. A+ for that. The brush seems wider than that of drugstore brands. Works the same. The glass file looks very nice, simply designed. These files are supposedly more gentle on the nails and help reduce the amount of chipping, splitting, and peeling when used on a regular basis. I like that the glass doesn't hurt the skin under the nail while filing. 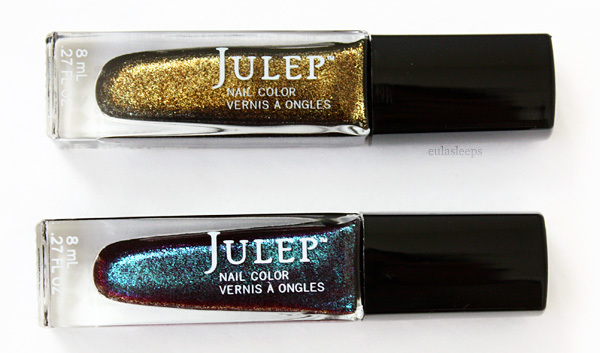 Color me impressed with Julep's great formula and abundantly pretty colors. It doesn't come cheap; at 8 ml per bottle you get half the volume of a drugstore polish for double the price. 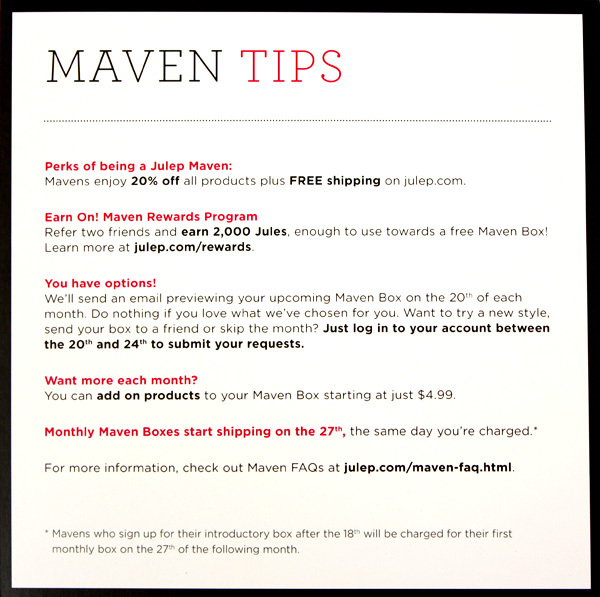 I think the best way to get these is to become a Maven, because you get 20% off and special deals as listed in the "Maven Tips" card above. Julep Maven boxes ship out at US $19.99 monthly. You get a preview of the box contents on the 20th of each month, and you can cancel your subscription or skip a month any time -- as long as you do it before the 27th of the month so you're not automatically charged. Unfortunately they only ship to United States, US Minor Outlying Islands, and Canada. Click this link to take the quiz and get your own free box. Just enter the code MAVENBFF at checkout.